Aspen has provided a variety of environmental services to the US Army Corps of Engineers for the Santa Ana River Mainstem Project since 1996. The Santa Ana River Mainstem Project is a major flood control project spanning 75 miles along the Santa Ana River – from the upper canyon in the San Bernardino Mountains downstream to the Pacific Ocean at Newport Beach. Aspen has completed a wide variety of assignments on this extensive flood control project, including NEPA and CEQA documentation, construction monitoring, biological surveys, horticultural monitoring, permitting support, and preparation of mitigation plans. 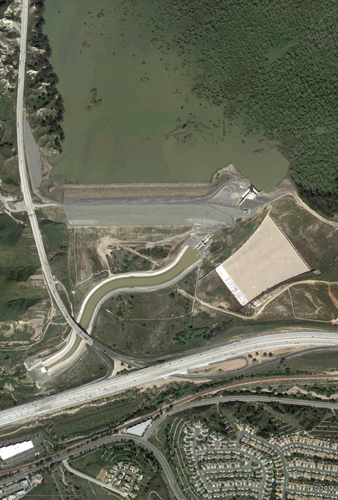 Since 2003, Aspen has monitored the construction of various components of the Santa Ana River Mainstem Project, including the Prado Dam Embankment & Outlet Works Project, construction of multiple dikes around the perimeter of Prado Basin, and downstream improvements along Reach 9 in Orange County. In addition, Aspen also monitored and mapped the clearing of vegetation at Prado Basin and the Dike construction areas, and Reach 9, Phases I and II, of the river. Endangered species residing in the riparian forest, riparian scrub and coastal sage scrub habitat include the Santa Ana sucker, least Bell’s vireo, willow flycatcher, and coastal California gnatcatcher. Aspen monitored the effect of construction activities on these listed species, including during required river diversions (fisheries monitoring for the Santa Ana sucker) and the nesting season. As part of the construction monitoring effort, Aspen conducted focused avian surveys in Prado Basin to ensure that construction avoided disturbance to federally listed nesting birds and supervised relocation of Santa Ana suckers in construction zones. Aspen also prepared a wildlife corridor enhancement plan for Prado Dam and a Revegetation Plan for the Reach 9, Phase I, portion of the project. Implementation of this Revegetation Plan has been underway since 2004 and includes annual quantitative vegetation surveys and preparation of corresponding reports. Weekly and Quarterly Reports were prepared by Aspen to document ongoing monitoring, construction, and vegetation clearing activities. Aspen monitored the construction of flood control improvements in the vicinity of Prado Basin, including the Green River Golf Course Project and Auxiliary Dike Project. As part of this monitoring effort, Aspen conducts noise and water quality monitoring. Aspen also monitored for the presence of nesting species in and near the project areas, including least Bell’s vireo. The Aspen Team also monitored the effect of river diversions on the Santa Ana sucker. Weekly, Quarterly, and Annual Reports are prepared by Aspen to document ongoing monitoring, construction, and vegetation clearing activities. Prado Basin, Reach 9, and Norco Bluffs SEIS/EIR. Aspen prepared the Final Supplemental EIS and Project EIR (SEIS/EIS) for the Prado Basin, Reach 9, and Norco Bluffs components of the Santa Ana Mainstem Project. The SEIS/EIR examined the impacts associated with stabilizing erosion at Norco Bluffs, changes in inundation levels behind the dam, increased release volumes from Prado Dam under new operations, and bank stabilization downstream (Reach 9) from the dam. Aspen revised the Draft SEIS/EIR, including a new air quality analysis and substantially revised biological resources analysis, and prepared responses to all public and agency comments on the Draft SEIS/EIR. Aspen also prepared a revised General Conformity analysis, 404(b)(1) analysis, prime and unique farmlands evaluation, and Streambed Alteration Agreement application. Auxiliary Dike and Alcoa Dike. Aspen prepared separate Supplemental EAs and EIR Addendums for the Auxiliary Dike and Alcoa Dike Projects. Aspen analyzed revisions to the design of the embankment to reduce impacts to vegetation. Reach 9 Phase 2A Embankment Project. Aspen prepared a Supplemental EA and EIR Addendum for the Reach 9 Phase 2A Embankment Project. The proposed bank stabilization includes grouted stone and sheet pile protection around the Green River Housing Estates and along the State Route 91 Freeway immediately downstream of the Prado Dam drop structure. Biological Assessment for the Seven Oaks Dam Pre-operation and Operation. Aspen collaborated with MEC Analytical Systems for the preparation of the Seven Oaks Dam Biological Assessment that assessed impacts from operation of the dam on the Santa Ana River Wash in San Bernardino County. The document addressed a number of threatened and endangered species, including the Santa Ana woolly star, slender-horned spineflower, San Bernardino kangaroo rat, California gnatcatcher, least Bell’s vireo, southwestern willow flycatcher, arroyo toad, California red-legged frog, and Santa Ana sucker. Slender-Horned Spineflower Survey, Santa Ana River Wash. Aspen managed an intensive survey of the Santa Ana River Wash (below the Seven Oaks Dam) in San Bernardino County to identify populations of the endangered slender-horned spineflower. The crew surveyed 3,000 acres during an intensive 25-day survey period using a Global Positioning System (GPS) unit to record all survey transects and populations found. Environmental Assessments for Upper Santa Ana River and Seven Oaks Dam – Woolly Star and Stockpile B. Aspen managed preparation of two EAs under this delivery order, both related to mitigation of impacts associated with construction of Seven Oaks Dam. Horticultural Monitoring, Reaches 1 and 10, Lower Santa Ana River. Aspen served as horticultural monitor to evaluate the success of a series of hydroseeding efforts along the levees of the Lower Santa Ana River from the Pacific Coast Highway to the Adams Street Bridge. Environmental Assessment for Lower Santa Ana River Operation and Maintenance. This EA was prepared to analyze the potential impacts of operation and maintenance activities along the Lower Santa Ana River, from Weir Canyon Road to the Pacific Ocean, as defined in the Operation, Maintenance, Repair, Replacement, and Rehabilita­tion Manual for the Lower Santa Ana River Channel.